To configure the Board Web Server program run the Web Server Configuration program on the machine where the Board Web Server is installed. Publish on Port. Sets the TCP/IP port number of Board's HTTP service. Note that Board Web server uses two TCP/IP ports, by default port 83 and 84. The first port is the HTTP service port used to download the Board Web Client, the second port is the communication port. Note that Board's screens and objects are served to the user's browser through the Silverlight service only. Local Path. Defines the root directory of the HTTP service. By default c:\Board\Web. The file index.html found in this directory is the first page served to users accessing the Board Web Server site. SSL. Enables SSL on Board's web service (HTTPS). Use the Select button to specify your certificate for SSL encryption. Single Sign-On. Abilita il single sign-on. Credentials exchange encryption password. Use the Random option to encrypt credentials with a random key. Use the custom field to encrypt credentials with a specified key. Host. Address of the server where the Board Server service is running. If the Board Web Server is installed on the same computer of the Board Server, specify Localhost. Base Port. TCP/IP port number of the Board Server service, by default is 9700. To find out what is the base port of your Board Server service, run the Board Server Configuration program on the machine where Board Server is running. SSL. 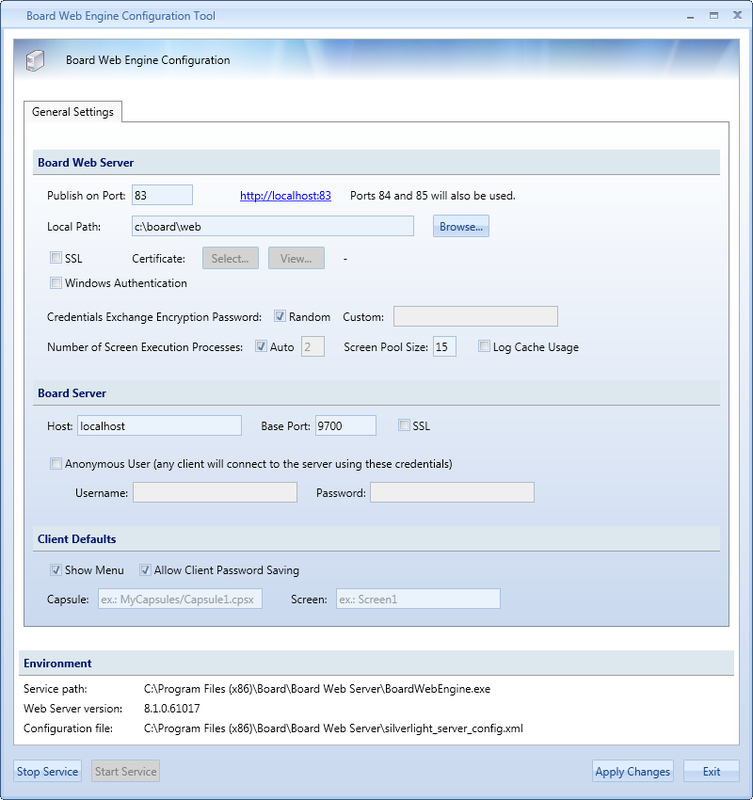 Enable this option if your Board Server service requires SSL authentication. Refer to the Board Server Configuration to find out if SSL is required. Anonymous user. When enabled, all users connect without having to type username and password, all users will inherit the same credentials. Show Menu. Enable this option to view the Board button menu in the web pages. This will allow users to open capsules located on the Board Server. Allow Client Password Saving. Allows web users to save their password locally when they first login the web site. If disabled, the browser doesn't show the option "Save Password" in the logon panel. Capsule. Defines a default Capsule to be opened when users log-on. If no Capsule is specified the open Capsule window automatically appears after log-on. Screen. Specifies the screen to open for the default capsule specified above. 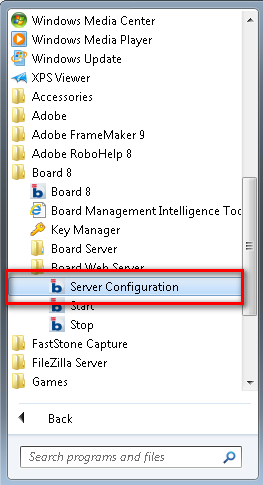 After changing any of the parameters, stop and restart the Board Web Server service. The following diagram shows the communication ports used a Board Web Server architecture. The default HTTP service port of Board Web Server is 83, this port can be changes to the standard port 80 if desired. The next TCP/IP port, number 84, is used for communications between the Board Silverlight Web Client and the Board Web Server. 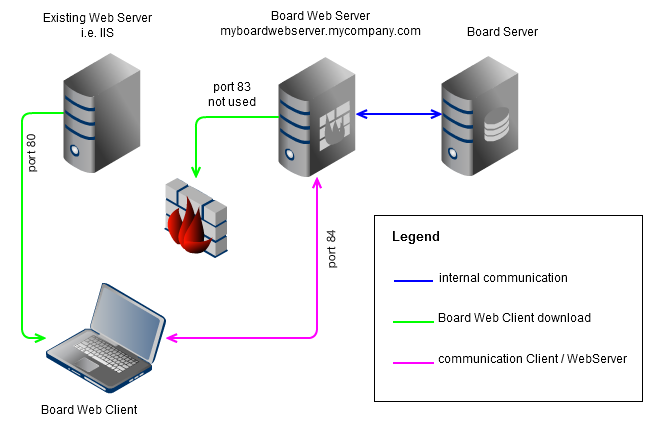 The Board Web Server program communicates with the Board Server program through the standard port 9700 and receives from the Board Server all necessary data to produce the requested pages and actions. All configuration parameters are accessible from the program Board 7 Web Server Configuration Tool. It is possible to use a Board Web application with the HTTP service of another Web Server such as Microsoft IIS or Apache. Copy the content of the directory C:\Board\Web in a http directory of your third party web server (i.e. IIS, Apache). Refer to your http server documentation for details. this is the reference that invokes the Board Web application on the Board Web Server. 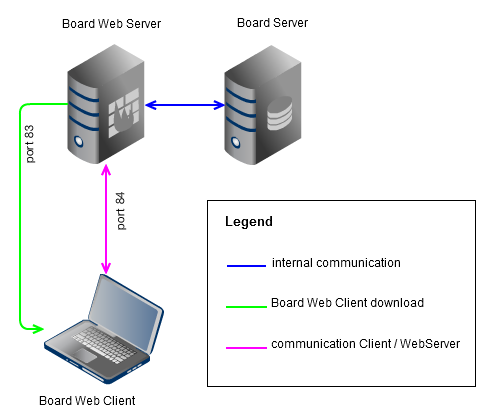 The architecture of Board Web Server working together with an existing web server is illustrated in the diagram below. When the user opens with his browser a page located on the main Web Server, the server sends back a HTML page which contains a reference to the Board Web Client or in other words a reference to a XAP file, which is the Board Silverlight application. The Board Silverlight application opens a communication stream (using a web service) on the default port number 84. Note that this port number can be changed, it is the Board Web Server port number +1 (see above). Note that in the above configuration the http service of Board Web Server (default number 83) is not used, it is possible to close port 83 on the firewall.